The Dewfish Demonstration Reach is a 110 kilometre stretch of waterway in the Condamine catchment in southern Queensland consisting of sections of the Condamine River, Myall Creek and Oakey Creek near Dalby. The Reach was established in 2007 with the purpose of promoting the importance of a healthy river system for the native fish population and the greater river catchment and demonstrating how the restoration of riverine habitat and connectivity benefits native biodiversity and local communities. 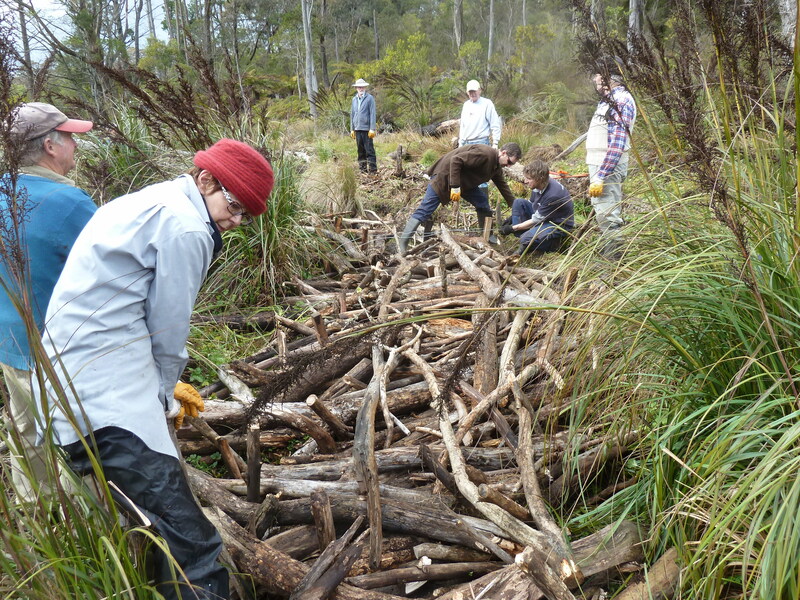 Landholders, community groups, local governments and residents have worked together to learn and apply new practices to improve and protect this part of the river system. Re-introduction of large structural habitat at five sites, involving the installation of 168 habitat structures consisting of trees, fish hotels, breeding pipes and Lunkers (simulated undercut banks). 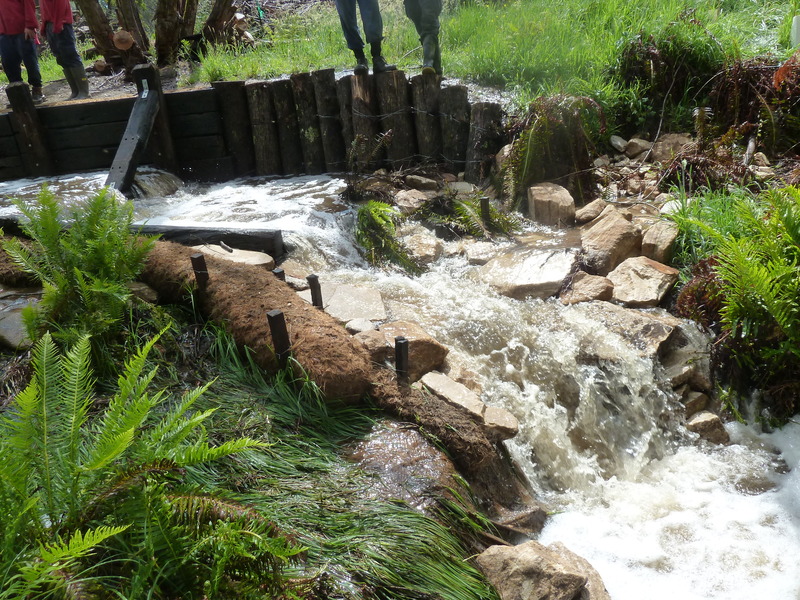 Improvement of fish passage (by more than 140 km) with the upgrade of the fishway on Loudoun Weir and the installation of two rock-ramp fishways on crossings in Oakey Creek. Ongoing management of pest fish, involving carp angling competitions, carp specific traps, electrofishing and fyke nets. 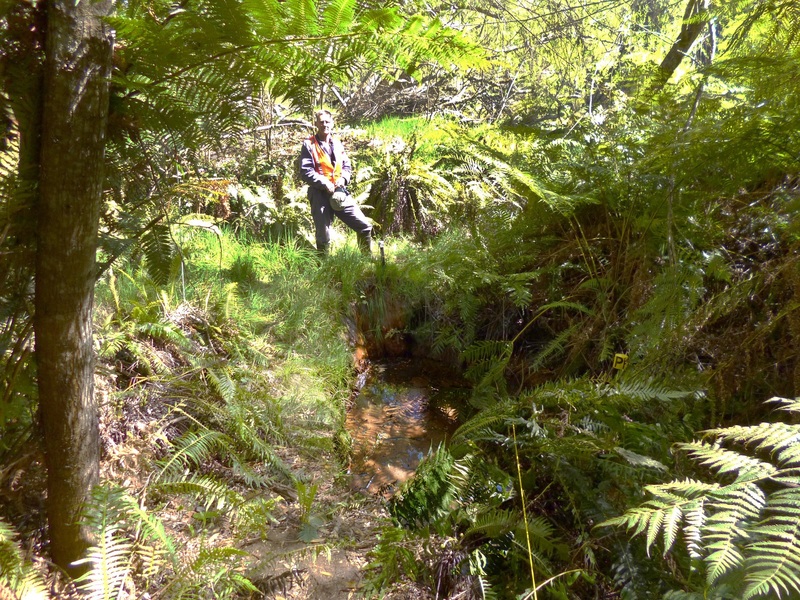 Rehabilitation of the riparian vegetation over 77 km of the Reach using stock exclusion fencing, off-stream watering points, weed control and replanting of native vegetation. 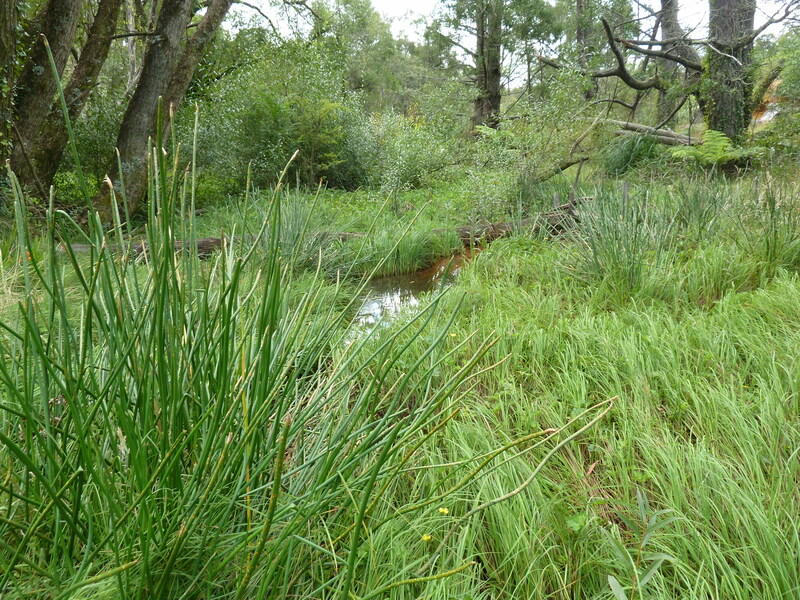 In Dalby, a 1 metre wide unmown buffer was established on the banks Myall Creek. Twice-yearly monitoring using a MBARCI model (multiple-before-after-reference-control-intervention) was undertaken to detect the local and reach-wide impacts of the intervention activities. Surveys involved sampling of the fish assemblage at fixed sites and assessment of the instream and riparian habitat. Results. The surveys indicated many of the intervention activities had a positive impact. 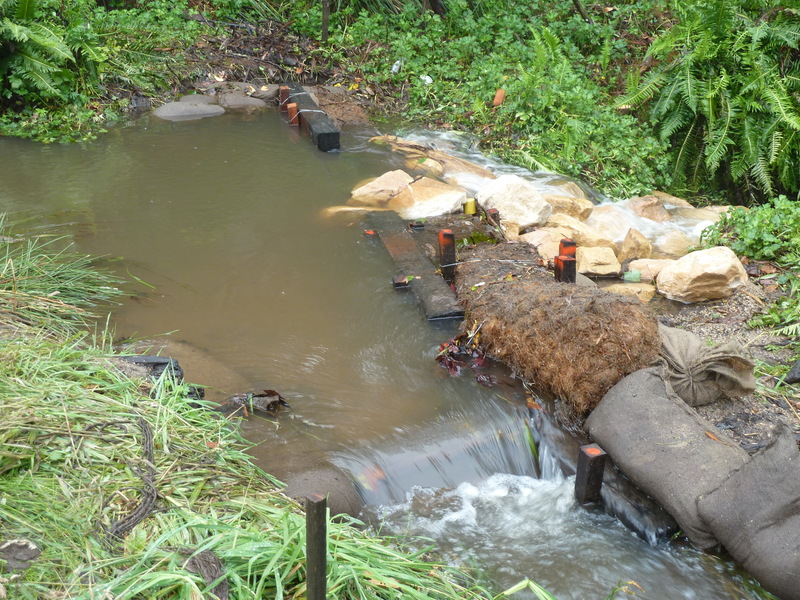 The fish assemblage and riparian habitat improved at all intervention sites in the Dewfish Demonstration Reach since rehabilitation activities commenced. The fish assemblages at introduced habitat structures were very similar to those found on natural woody debris, suggesting the introduced habitat is functioning well as a surrogate. There were significant increases in the abundance of larger fish species, including Golden Perch (Macquaria ambigua) (up to 5-fold), Murray Cod (Maccullochella peelii peelii) (from absent to captured every survey), Spangled Perch (Leiopotherapon unicolor) (up to 9-fold) and Bony Bream Nematolosa erebi (up to 11-fold) in intervention sites following re-snagging. Murray Cod and Golden Perch are now consistently being caught from introduced woody structures and local anglers are reporting that the fishing has improved greatly. Despite this increase there is still limited evidence of recruitment in the area. There have also been small increases in Eel-tailed Catfish (Tandanus tandanus) and Hyrtls Tandan (Neosilurus hyrtli) abundances and a limited amount of recruitment has been observed for these species. The abundance of smaller native fish has improved significantly in response to the intervention activities undertaken, especially where bankside and instream vegetation was improved. In Oakey Creek Carp Gudgeon (Hypseleotris spp.) abundance increased 1200-fold, Murray-Darling Rainbowfish (Melanotaenia fluviatilis) increased 60-fold and the introduced species Mosquitofish (Gambusia holbrooki) increased 9-fold following intervention activities. 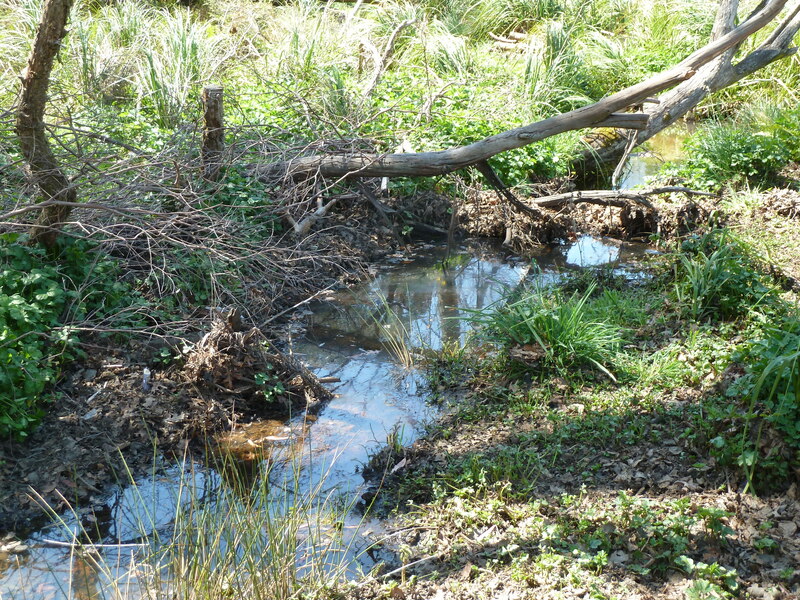 Establishment of a bankside unmown buffer on Myall Creek has enabled natural regeneration of vegetation and resulted in significant increases in aquatic vegetation and native trees. This has led to substantial increases in the smaller bodied native fish assemblage, including a 3-fold increase in Bony Bream, 237-fold increase in Carp Gudgeon, 60-fold increase in Murray-Darling Rainbowfish and a 35-fold in the introduced Mosquitofish. The abundance of pest fish remains low, except for Mosquitofish which have increased in abundance with the improvements in the aquatic vegetation. There is little evidence of Carp recruitment (Cyprinus carpio), suggesting active management may continue to suppress the population and minimise this species impacts in the Reach. Lessons learned and future directions. Improvements of the waterway health and ecosystems can lead to positive responses from native fish populations. Targeting rehabilitation activities to specific classes of fish has been very effective. Re-establishing healthy bankside and aquatic vegetation has been vital in boosting the abundance of juveniles and smaller species. Improvements in the extent of aquatic vegetation have unfortunately also resulted in increased numbers of the introduced pest, Mosquitofish. However, the overall benefits to native fish far outweigh impacts from the increase in the Mosquitofish population. Stakeholders and Funding bodies. A large number of stakeholders have been involved in this project. The project’s success is largely due to the high number of engaged, involved and committed stakeholders. Without this broad network, costs to individual organizations would be higher and strong community support less likely. Major funding has been provided by the Murray Darling Basin Authority, Condamine Alliance, Queensland Department of Agriculture and Fisheries and Arrow Energy. The Slopes2Summit (S2S) Bushlinks project commenced in August 2012 and is in the first stage of implementing on-ground works to build landscape-scale connectivity across private lands in the southwest Slopes of NSW – from the wet and dry forest ecosystems of the upper catchment and reserves to the threatened Grassy Box Woodlands of the lower slopes and plains (Fig 1.). The increasing isolation of plant and animal populations in “island” reserves scattered through an agricultural landscape is a recognised threat to the long term viability and resilience of ecosystems under potential impact of climate change. If we can increase the viable breeding habitat through off-reserve remnant conservation, and increase the habitat for dispersal by increasing connectivity, we may be able to influence the trajectory for some of our species – the Squirrel Glider (Petaurus norfolcensis)) and threatened woodland birds in particular. 1. Cross property planning. 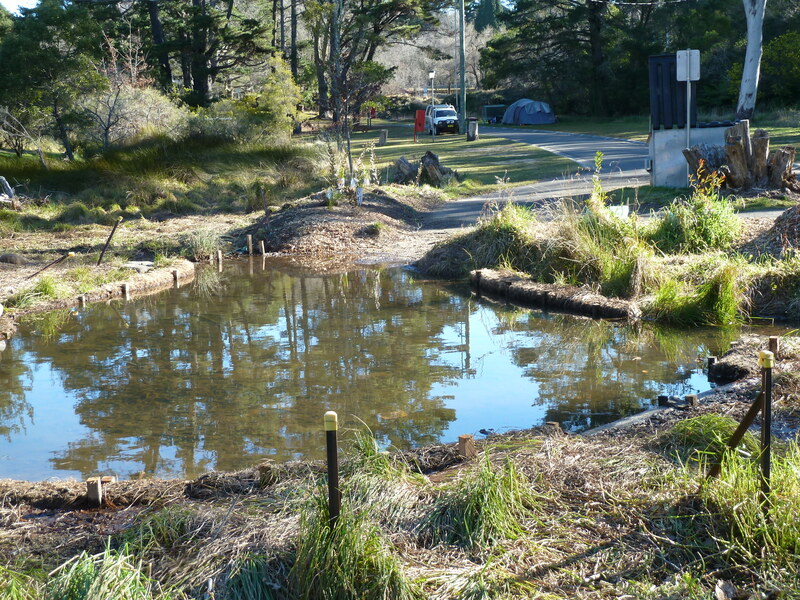 Foster and encourage cross property planning for habitat connectivity between neighbours, community, Landcare and/or subcatchment groups resulting in more integrated on-ground works projects, and raising awareness of the benefits of connectivity for wildlife. 2. On-ground investment in connectivity. 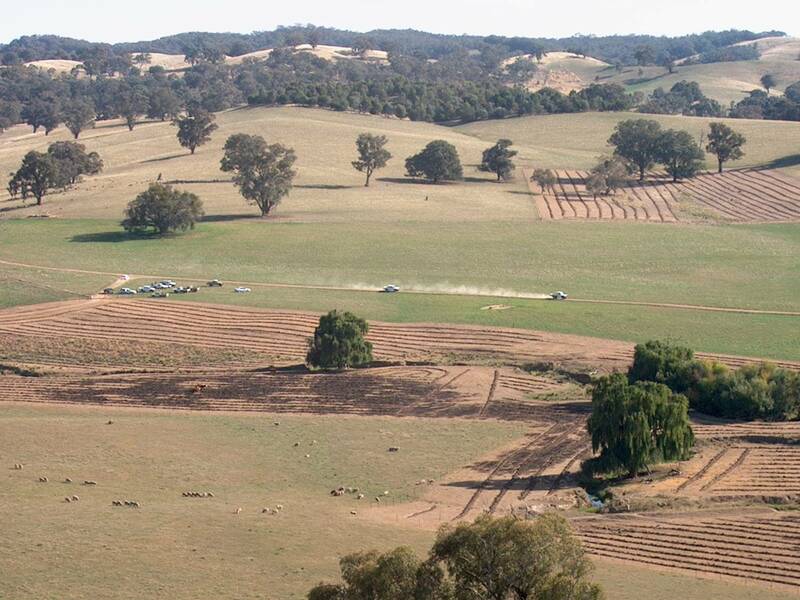 The project is partnering with farmers and land managers to support and encourage fencing and revegetation in strategic places in the landscape with the objective of increasing habitat connectivity. S2S Bushlinks applies scientific principles to the site assessments and evaluation, which then sets the level of investment in a site. High scoring sites receive the highest rates of rebate, but the provision of low levels of public investment in sites that may not be of high priority is important for fostering participation in revegetation of any sort to encourage the culture of caring for the land. 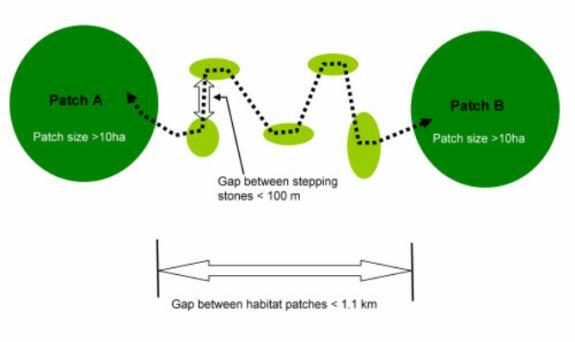 Connectivity and landscape value – Does the site link to or create new patches of habitat according to principles of habitat connectivity? (Fig 2) Is there existing vegetation in 1000ha radius around the site in an optimal range of 30-60%? Area : perimeter ratio – Bigger blocks of revegetation are more cost-efficient and better habitat than linear strips of revegetation, and the project scoring encourages landholder to go bigger and wider in order to qualify for a higher level of funding. 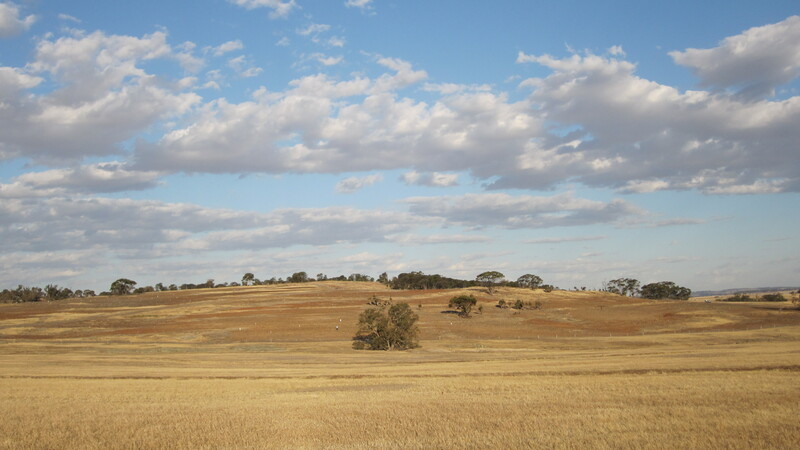 Habitat Values – Does the site have existing values like old paddock trees, rocky outcrops or intact native ground layer, and therefore become a more valuable site? Is it in the more fertile, productive parts of the landscape and therefore of more productivity benefit for wildlife as well? 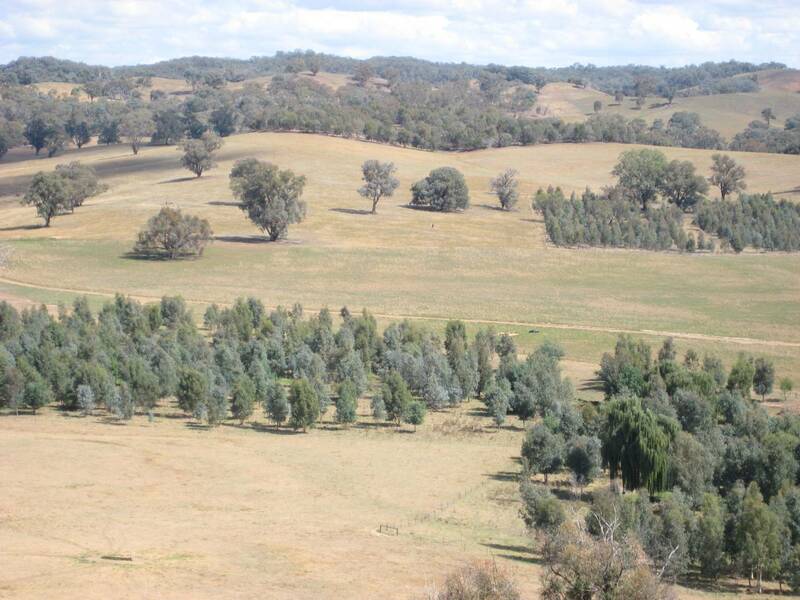 Carbon value – The scoring is based on the size of the revegetation and rainfall zone. The CFI Reforestation tool is being used to value the collective potential carbon sequestration of the Bushlinks project. The emphasis on cross-property planning flows through to the implementation of on-ground works. Landholders are encouraged to work with neighbours and the site evaluation system is used to assess site value without the property boundaries – cooperation makes the site bigger and usually increases the connectivity value, and therefore scores higher. 3. Review and adaptive management process. The site assessment is to be reviewed in July 2013 against the objectives – did it work to prioritise sites well – did we invest wisely? 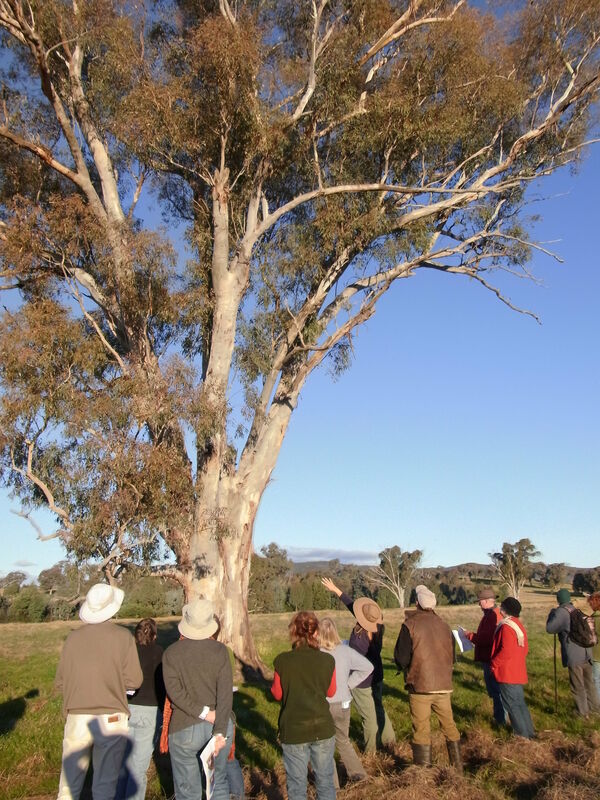 The scientists and experts are then able to work closely with Holbrook Landcare to adjust the project eligibility, assessment and evaluation criteria to continually improve the outcomes in subsequent funding years. 4. Monitoring framework. 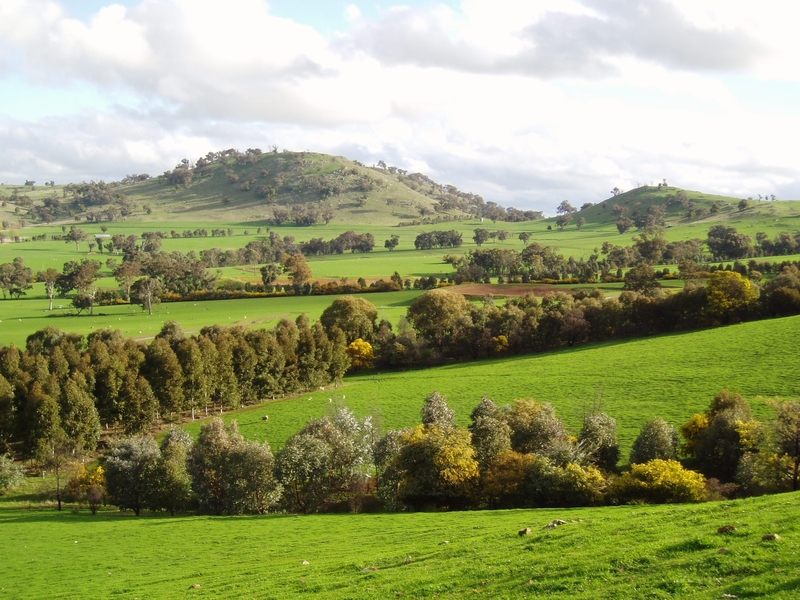 As part of the in-kind contribution to the project, S2S partners Dr Dave Watson, CSU Albury and Dr. Veronica Doerr, CSIRO are working towards a framework for the long-term monitoring of landscape scale connectivity for continental-scale initiatives like Great Eastern Ranges (GER). As part of a GER Environmental Trust Project in 2013, an expert panel workshop will be convened to begin this process in 2013. The framework will then be used to pilot a project-scale design for Bushlinks, which will allow us to measure ecological outcomes. 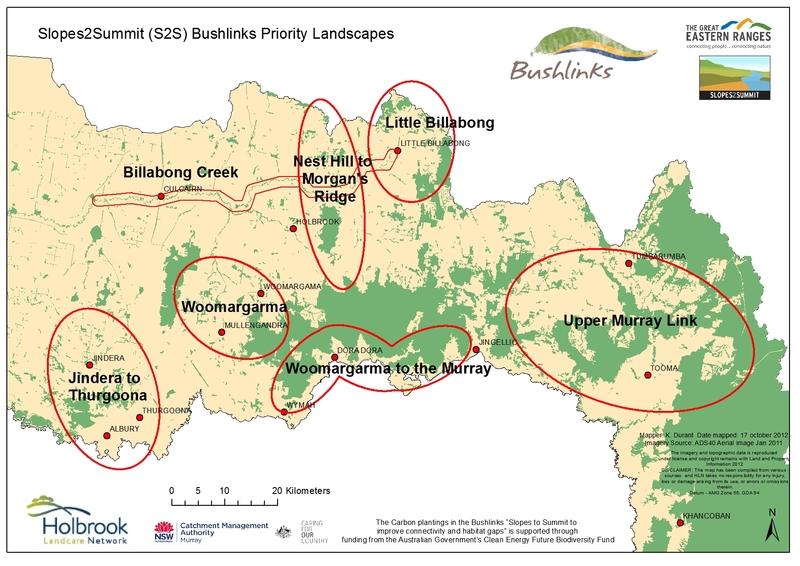 Bushlinks will contribute to the Slope2Summit portal of the Atlas of Living Australia, supported by the Slopes2Summit facilitator. To develop community participation in monitoring and evaluation, participants and the wider community will be encouraged to contribute wildlife sightings and other data to the atlas. The S2S partnership applied for funds through the Australian Governments Clean Energy Futures Biodiversity Fund in 2011 and was successful in the 2011/12 funding year for a six year project. 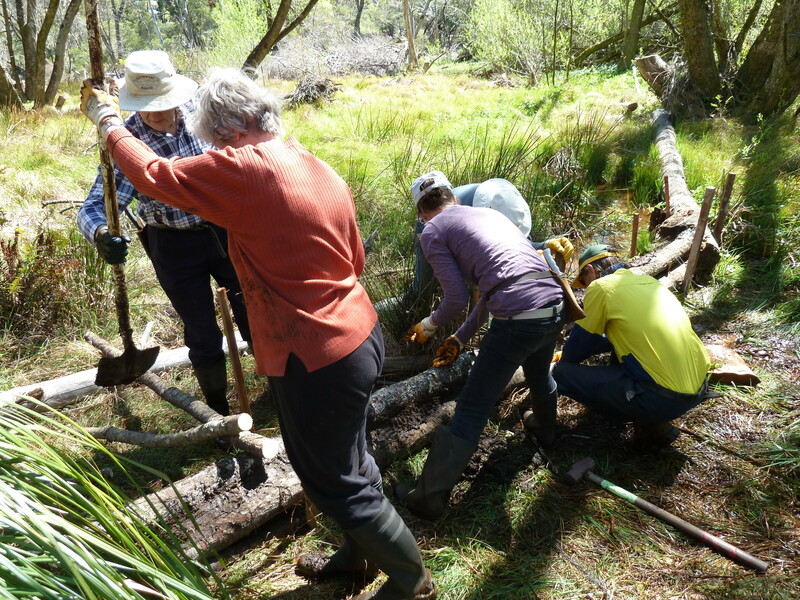 Holbrook Landcare Network is managing the S2S Bushlinks Project on behalf of the Slopes2Summit and the Great Eastern Ranges Initiative, in partnership with Murray CMA. Introduction. Multiple, simultaneous, and rapid environmental changes make sustaining and restoring ecosystem functions an increasingly important but challenging task. 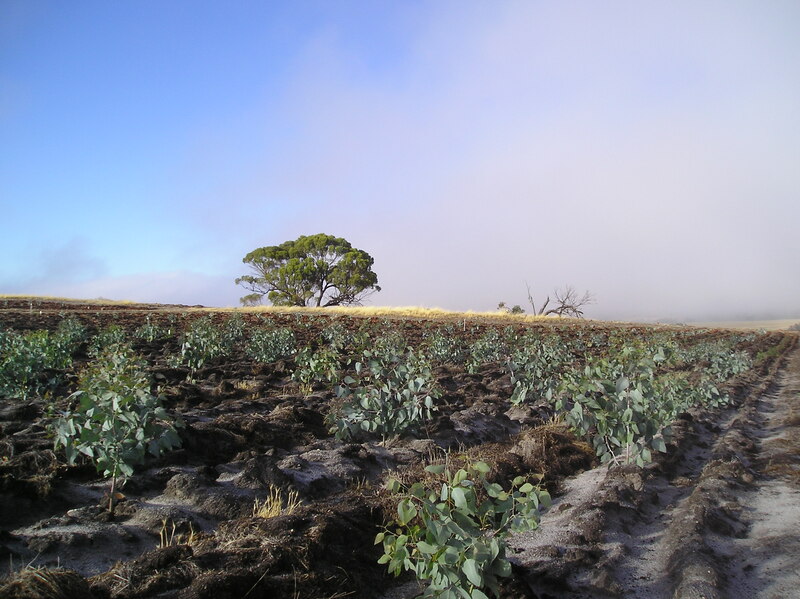 The Ridgefield Multiple Ecosystem Services Experiment, being undertaken at the University of Western Australia’s Future Farm in the Western Australian wheat belt, tests the application of current ideas in ecology to ecological restoration, and seeks insights into how management interventions can sustain and restore multiple ecosystem functions in an era of rapid environmental change. Design. 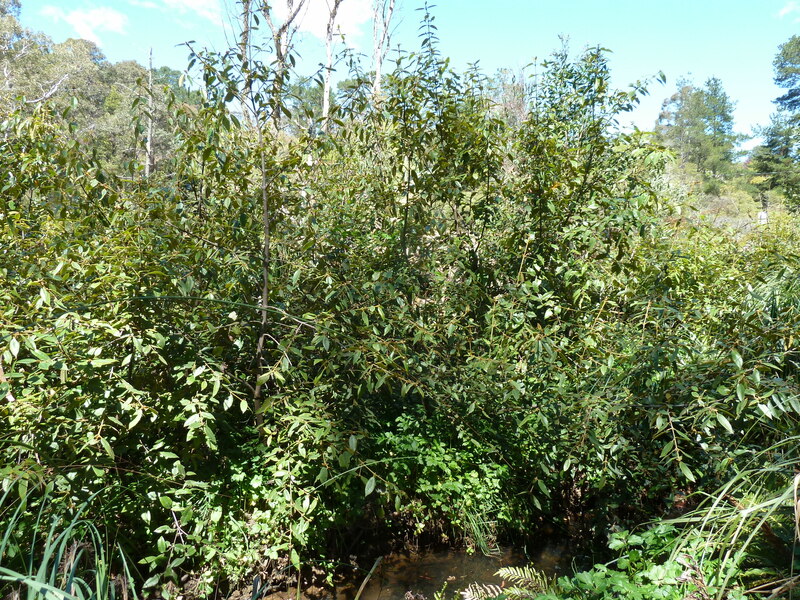 Our experiment tests how different woody plant species mixtures affect provision of ecosystem functions and services, including carbon storage, nutrient cycling, invasion resistance, biodiversity maintenance, and prevention of soil erosion. We also consider potential tradeoffs in the provision of ecosystem functions, how different plant species mixtures may respond to simultaneous environmental changes, and how different plant species assemblages may affect other trophic levels, both above and below ground. Experimental treatments, across 124 23x11m rip line plots, comprise native tree and shrub species, and span a diversity gradient from bare and single-species to mixtures of eight species. Species belong to four different functional groups based on differing nutrient acquisition strategies and morphologies. Plant assemblage treatments are replicated across former grazing and cropped landscapes. In addition to the role of species composition in determining ecosystem functions and services, we will examine the effect of simultaneous environmental changes (nitrogen deposition and weed invasion) on our chosen functions and services, particularly since the presence of exotics creates potentially novel ecosystem states. Our experiment will allow us to understand more about how combinations of plant species, and their associated traits, can be utilized to intervene and manage ecosystems to ensure capacity for ongoing function and service provision in the Anthropocene. In terms of theory, we are also interested in whether the provision of multiple ecosystem functions requires greater biodiversity than provision of single services, if there are tradeoffs among services as diversity levels increase, and how the traits of included species affect functioning. Participants and potential for collaboration. Participants include: Mike Perring, Kris Hulvey, Rachel Standish, Lori Lach, Tim Morald, Rebecca Parsons and Richard Hobbs. The study provides a platform for the investigation of a wide variety of ecologically and socially important questions, and we encourage interested parties to contact us should they wish to collaborate or conduct trials at the site.